LeeBoards.com is here to educate the public about the value of leeboards and its history. "We sail the boat most weekends. We have a small regular crew and we take guests and tourists out free of charge as the boat is not in commercial survey. It is pretty comfortable even in winds of 25 knots and more, though we do sail in relatively protected waters in those conditions. 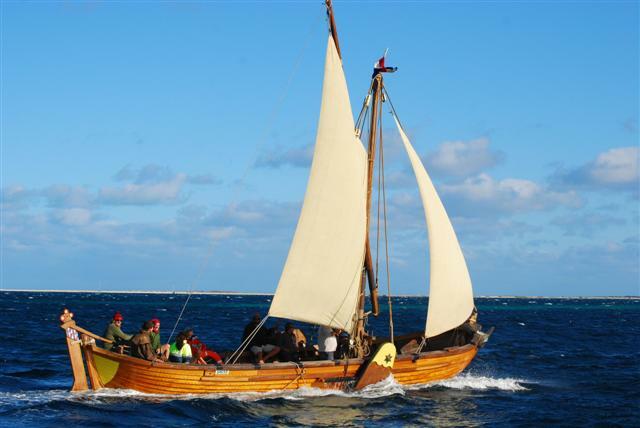 We've sailed the 40 miles out to the islands a couple of times and hope to take it the 1,500 miles up to Indonesia as a re-enactment voyage. Aiming for winter 2016 as that is the anniversary of Dirk Hartog's 1616 landing at Shark Bay about 200 miles north of here so we figure there should be some interest and money floating around." - Jeff B.
Disclaimer: Always wear life preservers, drink and party responsibly, sail at your own risk, and please pass the word that leeboard sailing is now a blast from the past that will soon be in the news as being the latest sailing craze.